Black Beauty was an important text for the Humane Education movement in this era. It was written by the British author Anna Sewell in 1877 and is, perhaps, the best-known of the “animal autobiographies” produced during this era, told from the perspective of a horse. The full title of the book as originally published is Black Beauty: his grooms and companions: The autobiography of a horse. Translated from the original equine. The book takes the form of a memoir, recounting various incidents from “Black Beauty’s” life. Moments of kindness and compassion are woven next to tales of mistreatment, a glimpse in to the life of working horses in 19th century Britain. This book has been extremely popular right from its first printing. In 1890 George T. Angell, founder of both the Massachusetts Society for the Prevention of Cruelty to Animals (MSPCA) and the American Humane Education Society (AHES), began publishing the book in the United States, citing it as a key book for Humane Education efforts. Hundreds of copies of this book were sold and given away through the outreach work of the AHES. Lantern Slide advertising 1921 film version of Black Beauty. Collection of MSPCA Angell. 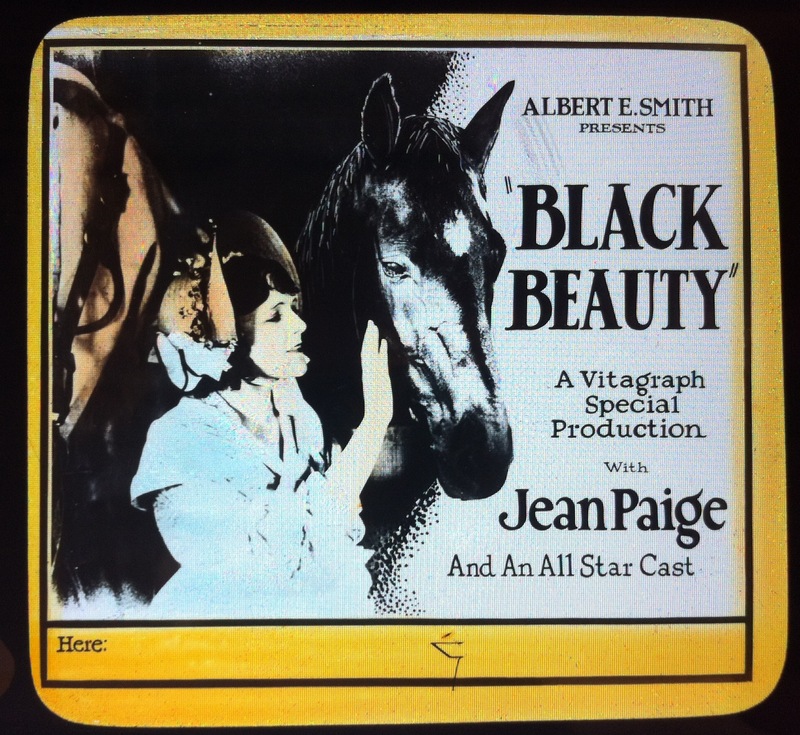 In 1921 the story of Black Beauty was adapted for the screen, and lantern slides like the one above were an important way of advertising the film. The film was a silent film and starred Jean Paige, an American actress who appeared in 21 silent films between the years 1917-1924.